I really liked Moroccan Rose. Very nice, somewhat musky and floral mix, not as strong as Ward but still reminds you of a garden full of roses. Highly recommended. it is very fresh floral scent. This is my first purchase and It will definitely be one of my best attars. 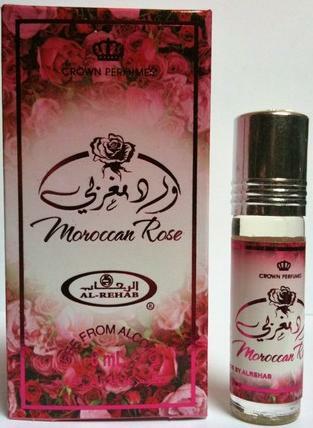 Moroccan Rose has a sweet, feminine, delicate aroma which is full of character. Moroccan Rose has a sweet, feminine, delicate aroma which is full of character. I love this scent it is exquisite! I love Arabian perfumes, I have found them to be far superior in blend and quality to Western Perfumes, and are better value for money. Moroccan Rose is my all time favourite and I would give it 100 stars! !